OXFORD, Miss. 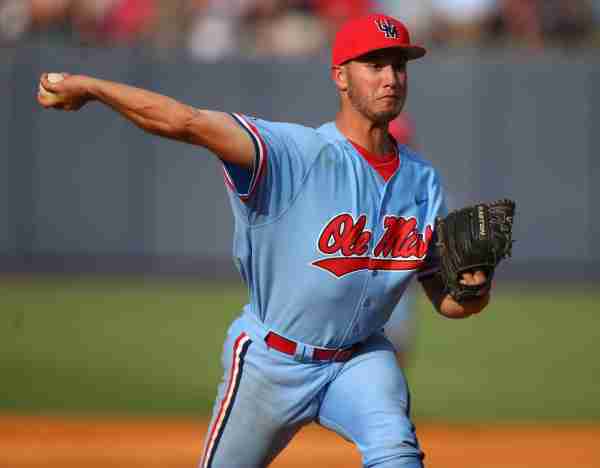 — Ole Miss capped off an impressive weekend of games with a 10-3 win over Auburn on Saturday to complete the sweep. The Rebel bats were hot during the series, combining for a total of 23 runs and 34 hits during the three-game stretch. After falling behind in the first two games, Auburn finally got an early lead Saturday. The leadoff hitter for the Tigers, Will Holland, homered to give Auburn a 1-0 lead. Head coach Mike Bianco trotted out James McArthur for game three, a reliable arm in the rotation who came in with a 4.09 ERA and a 5-0 record on the year. However, after giving up a home run in the first, he soon gave up another run in the second which gave Auburn a 2-0 lead. Bianco had seen enough and decided to pull him after just 1.1 innings of work. If you’ve watched this Ole Miss team at any point during this season, you’ve learned one thing; they’re never out of it. Three consecutive base hits and corresponding RBI from Anthony Servideo, Grae Kessinger and Ryan Olenek helped Ole Miss storm back to take a 3-2 lead. “(The players) have to show up today,” Bianco said. Will Ethridge took over on the mound after McArthur and found great success. He dominated for 6.2 innings and allowed only one ER and three hits while striking out 10 of the 20 batters he faced. “He was terrific,” Bianco said. Auburn tied things up at three in the fifth, but it wouldn’t be long until the freshman phenom Tyler Keenan would destroy a ball to right field for his seventh home run of the year. Keenan will certainly garner attention for the SEC Freshman of the Year honor after a marvelous season at the plate and in the field at third base. “I wouldn’t say anything is different,” Keenan said. Ole Miss apparently wasn’t satisfied with a one-run lead heading into the ninth, so the Rebels decided to put up six more runs in the eighth. Kessinger, Chase Cockrell, Michael Fitzsimmons and Nick Fortes all recorded an RBI in the inning to give Ole Miss a commanding 10-3 lead, which would be the final score. “One of the things about this offense is they play all 27 outs,” Bianco said. With the season coming to an end next weekend at Alabama, the race for the top of the SEC West is heating up. Ole Miss now sits just a half-game behind Arkansas for first in the SEC West standings. Arkansas completes its weekend series with A&M on Sunday, and should the Hogs lose, they would be tied with the Rebels with only one weekend remaining. While the Rebels play the Crimson Tide, the Razorbacks travel to Georgia. 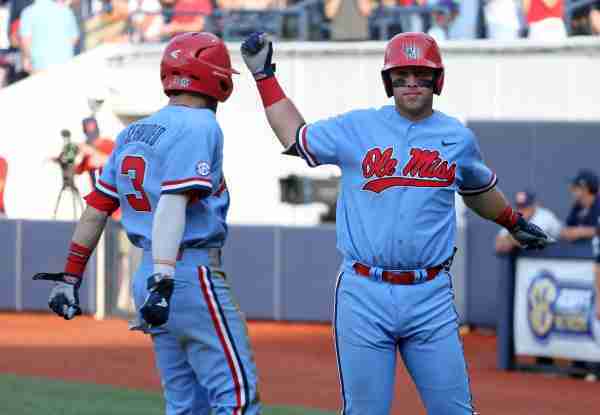 Luckily for Rebel fans, Ole Miss holds the tiebreaker over Arkansas due to the series win earlier in the season. “We’re just trying to stay where our feet are and win an SEC West championship,” Keenan said.